Recently there seems to have been an explosion of oil products for your hair, face and body with some claiming they can be used for all three. I myself have been very reluctant to try any of these products as, depending on the time of year and probably many other factors, my hair and skin do not need any help at all becoming oily. However, many of these products are described as ‘dry’ oil, what to me sounds like a bit of a contradiction in terms as by definition shouldn’t oil be, well, oily?! After reading another bloggers review (I’m really sorry I can’t remember who this was so I am unable to credit them, if it may have been your’s please let me know) I decided to try The Body Shop’s Beautifying Oil. These come in a wide range of fragrances (there’s 11 available on the website) which include strawberry, sweet lemon, chocomania and satsuma. 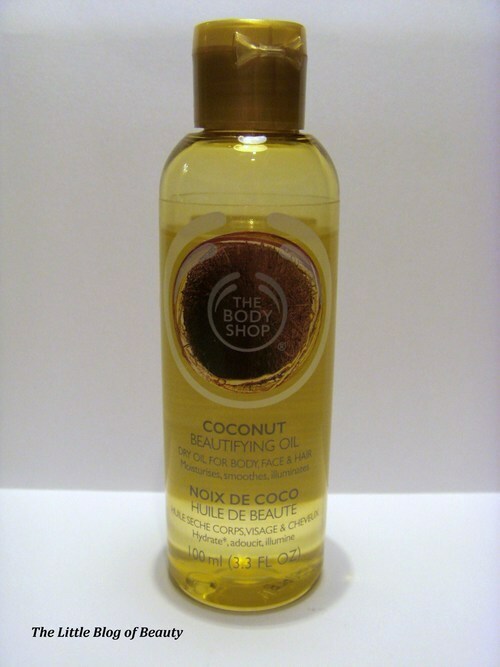 The review I read covered mango (which I do love the smell of) but I decided to go for coconut hoping it would remind me of holiday’s in the sun! When I tried this I’m pleased to say that I was pleasantly surprised. It’s smells lovely (yes I am transported to lying on a beach in the sun), is absorbed quickly and does not leave an oily residue on your skin. So, ta-dah, I have discovered that oils can indeed be ‘dry’. However, while this oil becomes dry on your skin, the bottle does get oily from handling it while you are applying the oil. This is not a huge problem, you just wipe the bottle down with a tissue once you have finished, but this is a part of using this product that I am not keen on. This also leaves a kind of shimmer on your skin (described as ‘illuminates’ on the bottle) which would look really good with a tan or on darker skin tones but does still look good on my snow white skin. In the winter particularly my skin becomes so dry and if I don’t try and keep my skin really moisturised I get patches of eczema (sometimes I still get it anyway) so how much moisture a product can keep or put into my skin is important. Although I’m not sure this would be as good as a lotion for my skin in particular, this did make my skin feel soft and moisturised. At £9 for just 100ml you do not get a very big bottle for your money however as an oil you use less than you would a lotion so I think this would probably last reasonably well. I ordered this from The Body Shop website going through Quidco (a cashback site) and got 35% off, free delivery and then also 18% cashback on the reduced price, so I paid just £4.80. In general I was impressed with this and think I may just have been converted to trying other oil products. Quidco currently have various offers for The Body Shop including up to 50% off and 16% cashback. You can sign up to Quidco through the following link http://www.quidco.com/user/847891/ (this just lets Quidco know I referred you).